Pre-order The Daedalus Incident today! OK…now this is getting real. 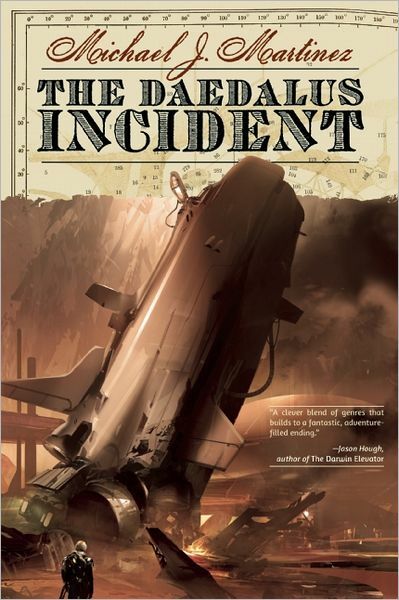 The Daedalus Incident is now available for pre-order on Amazon.com and Barnes & Noble! That’s right, the book is now a Real Thing that you can purchase today. I mean, it won’t be delivered until May 7, but you can purchase it today. Be an early adopter! Tell all your friends that, yes, you were among the first. When everyone starts talking up this crazy book they heard about, the one where a sailing ship crashes into Mars, you can nonchalantly lean back and say, “Yeah, I pre-ordered it.” You are instantly cool. I’ll be updating the blog with other vendors offering The Daedalus Incident for pre-order as I hear about them, and I also expect that the book will be available in a variety of e-book formats and, yes, audiobook as well. I would also urge you to ask about The Daedalus Incident at your local independent bookseller. Let’s keep those indie bookstores going! It’s humbling to think that your writing could inspire art. The fact that that my book inspired this particular cover is just amazing. Hats off to the good folks at Night Shade Books for producing such an incredible piece of art and design. And yes, that’s a quote from the talented and righteous Jason M. Hough, whose book, The Darwin Elevator, is also out next summer from Del Rey. Thanks, Jason! A tip of the hat goes out to the Qwillery, a wonderful blog dedicated to promoting debut authors. The Qwillery was the first to spot The Daedalus Incident pre-order pages out in the wild. I’m honored that the site has included me in its 2013 Debut Author Challenge, which is a great way for SF/F readers to check out new authors and possibly win a $100 bookstore gift certificate as well! You should totally check it out. All right…that should cover it for now. Big news day. Please, early adopters, check out the pre-order pages and tell all your friends and social media peeps about The Daedalus Incident!